alaTest has collected and analyzed 108 reviews of Sony DCR-PC109. The average rating for this product is 4.1/5, compared to an average rating of 4.0/5 for other Camcorders for all reviews. Opinions about the battery and design are overall positive. The image quality and portability also get good feedback. Some have doubts about the viewfinder and memory. We analyzed user and expert ratings, product age and more factors. Compared to other Camcorders the Sony DCR-PC109 is awarded an overall alaScore™ of 80/100 = Very good quality. alaTest has collected and analyzed 7 user reviews of Sony DCR-PC109 from Amazon.co.uk. The average user rating for this product is 3.3/5, compared to an average user rating of 4.0/5 for other Camcorders on Amazon.co.uk. Reviewers really like the battery and design. The image quality and portability also get good feedback, but there are some critical comments about the reliability and durability. alaTest has collected and analyzed 31 user reviews of Sony DCR-PC109 from Amazon.com. The average user rating for this product is 3.8/5, compared to an average user rating of 3.9/5 for other Camcorders on Amazon.com. Reviewers are impressed by the battery and design. The image quality and portability also get good opinions. There are some less positive reviews about the memory and durability. 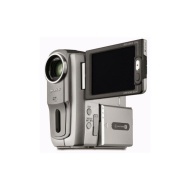 The highly portable, stylish Sony DCR-PC109 Handycam offers good video quality. Good video quality. Compact design. Good still-image capture for a 1-megapixel sensor. Sony's moderately priced matchbook camcorder this year, the DCR-PC109, has a 1/5-inch CCD with 690K effective pixels for video and 1000K effective pixels for still photos. It has a 10x optical zoom and a 2.5 inch LCD screen for monitoring your footage. Sony DCR PC109 is a Compact MiniDV Digital Handycam Camcorder with a 10x Optical Zoom. This pocket MiniDV camcorder excels outdoors, and back home, you'll love the Handycam Station dock. Compact and feature rich, the Sony DCR-PC109 MiniDV Handycam is the perfect camcorder for people who demand quality and convenience. Featuring a large 2.5" hybrid SwivelScreen LCD display, Super NightShot Plus infrared recording system, Super SteadyShot image stabilization, and a big 1.0 megapixel Advanced HAD imaging device, the DCR-PC109 provides all the punch of a camera twice its size. Combined with Memory Stick DUO media, it even doubles as a digital camera, able to take pictures as large as 1152 x 864 pixels. What really sets it apart from the competition, though, is its innovative Handycam Station, which provides quick and easy connection between the camcorder and your TV, VCR, or computer. Now, viewing your footage is easier than ever before. Plus, it provides power to the camcorder and charges the battery while you wait, assuring you a full charge whenever you use it.